This article is about the bay in New Zealand. For the community in British Columbia, Canada, see Jackson Bay, British Columbia. Jackson Bay / Okahu is a gently curving bay 24 kilometres wide, located on the West Coast of New Zealand's South Island. 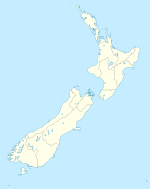 It faces the Tasman Sea to the north, and is backed by the Southern Alps. The westernmost point of the bay is marked by the headland of Jackson Head; in the northeast the end of the bay is less well defined, but the small alluvial fan of the Turnbull and Okuru Rivers might be considered its farthest point. The small Open Bay Islands lie five kilometres off the coast at this point. The bay marks the farthest southern extent of the West Coast's road network: the small road which meanders along the coast from Haast, 32 kilometres to the northeast, terminates at the sleepy fishing village of Jackson Bay, close to Jackson Head. This was the site of the landing of the early settlers of the area, and is close to the mouth of the Arawhata (or Arawata) River. The third river to enter the Tasman along this stretch of coast is the Waiatoto River, which enters the bay 10 kilometres to the east of Jackson Head. A renowned whaling station was established here to target migrating whales such as southern right and humpback whales. Jackson Bay was named Open Bay by Captain Cook; the origins of its current name are obscure. Possible namesake sources include: Port Jackson, New South Wales; James Hayter Jackson, a local whaler; or William Jackson, a sealer said to have been part of a party that was marooned in the area in 1810. Following the passage of the Ngai Tahu Claims Settlement Act 1998, the name of the bay was officially altered to Jackson Bay / Okahu. ^ "Ngai Tahu Claims Settlement Act 1998". Retrieved 28 March 2016. Reed, A. W. (2002). The Reed Dictionary of New Zealand Place Names. Auckland: Reed Books. ISBN 0-7900-0761-4. This page was last edited on 21 January 2018, at 09:32 (UTC).